People wonder why “generation x” is so messed up. There are people all over the world who actually get paid to try to dissect and repair our twisted up brains. I mean here we are in the middle of two of the biggest generations the world has ever seen. The baby boomers have all the money, run most everything right now and have no plans to die at a decent age. There’s something like 78 million of them. Right behind us is genY or whatever they want to be called. Another 75 some odd million of them with their own set of warped values. We’re nestled right in the middle with only a little over 50 million, because our parents (those boomers) originally thought they only wanted us. I’m not going to go into a deep dissertation on population and societal trends. Despite the title of this entry, that’s not what it’s about. I’m amazed at how much my childhood and the experiences I had come back to shape and affect who I am today. Even 20 years later, so experiences come flooding back in. As I’ve said in the past, I’ve fought to lose a lot of weight this year and change my lifestyle to something different and more healthy. I was raised in the deep south where if you couldn’t fry it, it wasn’t worth eating. And gravy was a food group. That definitely shaped my eating style and affected how I approached mealtime. It was tough to break through that to understand how to eat. I was also raised in the Bible Belt. We were conservative Christian Republicans. In our eyes, Democrats stood for what was wrong with the country and Ronald Reagan was here to save us from the Communists. Until Bill Clinton came along, my enduring images of Democrats were of Carter struggle through the gas shortages and the Iran hostage crisis, Walter Mondales futile presidential campaign and Dukakis riding in that tank with that stupid helmet on. When I started college and this young southern Democrat from Arkansas came along and talked with kids on MTV and acted like he cared about my vote and spoke with a passion about the country and was charasmatic, I was hooked. Politics changed for me in that instant in 1992. I’ve been a liberal believer ever since. There are simpler things too. I’ve always loved the holidays. I don’t live near my family anymore, but I’m excited to say that I’ll be headed home from Christmas this year for the first time in about 8 years. I haven’t been as excited about something in quite a long time. We do alright with holiday dinners around here, but for most of us, I don’t think anything can match mom’s cooking. That’s where Kenny & Dolly come in. 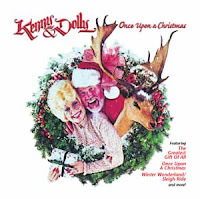 You see, there is this most evil of holiday albums, one that brings fear and loathing to hearts of GenXers all over the country when even mentioned. It’s repetitive playing from Thanksgiving through New Year’s during the mid 90s have left permanent scars on our psyches that may not ever be prepared. Our mom played it so much, and we were so tired of it, that I can remember my cousins and my sister and I hijacking it one year. We threw it out, just got rid of it. We just knew we had done it. No more Christmas Without You!! Never a Hard Candy Christmas again! Well as can be expected my Mom was worried. She looked high and low for the tape (yes, tape). Surprisingly, nobody cracked. Even my younger sister, who we expected to give up the info, stuck to the plan. It was the best. plan. ever. No it wasn’t. As we would soon find out, we grossly understimated the Mom. No sooner had we settled into a holiday season without the Gambler, than my mother hopped in her Buick Century, rode down to the Sound Shop at the local mall and bought another copy of the despised tape. I’ll never forget walking back into the house that day. I heard it before I even got in the door, and ran inside to discover the horror. It was useless. We were no match for the power of Kenny’s silky smooth voice and Dolly’s ample bosom. Fast forward roughly a dozen years and I’m driving down the road last week. XM’s holiday station is humming along when out of nowhere the sweet harmonies of those country legends start singing to me. Yep. Kenny & Dolly traveling from the past via the amazing satellite fed airwaves straight to my psyche, soul and memory. You’d think I would have wrecked my car immediately, on purpose and into the largest tree I could find. Funny thing is, I didn’t. I soon found out that this music had taken its place next to onions and celery, the Macy’s parade, and the sound of my mom singing as she cooked as a reminder of Christmases past and home. I jumped on Itunes and downloaded the album. I’m thinking of sending copies to my sister and cousins. My mom doesn’t need one. She’s got three copies. Merry Christmas Mom. Thanks for ruining me. I love you.